A warm drink full of antioxidants, flavor and refined sugar-free! During cooler months I love a warm "after-dinner" (non-alcoholic) drink. With the cooler temperatures I find I don't drink as much fluid as I probably should be drinking. Having a "fun" beverage is a way to remedy that as well as keep me from reaching for the cookies or ice cream during Sugar-Free January! Right now I'm on a cherry juice kick. As I mentioned in the Chocolate Covered Cherry Hot Chocolate post, cherry juice (and cherries) have so many nutritional benefits. I decided to add cherry juice to apple cider along with spices instead of the typical "mulling spices" packets that are packed with sugar. Did you know? Spices add more to the diet than just flavor. Many spices have anti-inflammatory and even anti-cancer properties. Spices add flavor without extra calories, sugar, fat or salt. 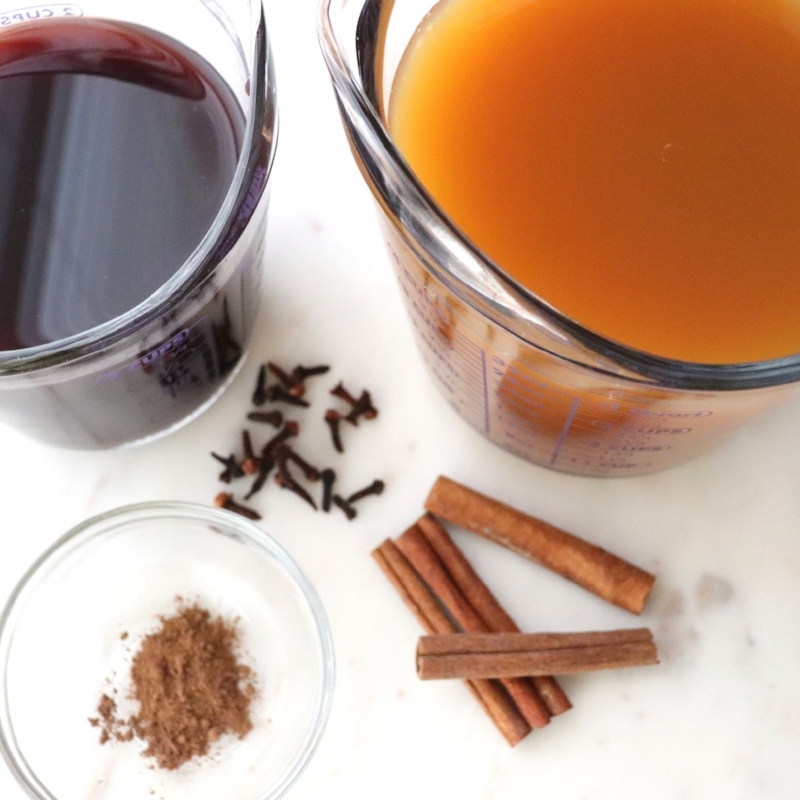 This recipe combines 100% apple cider (unfiltered) with 100% cherry juice. Steep the spices in the cherry-apple cider mixture for an hour and it's done! The spice mixture and juices also smell amazing as they simmer away - a kind of natural potpourri instead of that strong, oddly colored potpourri that you can buy! Combine all ingredients in a large saucepan. Heat to a simmer over medium heat. Simmer for one hour, making sure mixture doesn't boil. Strain out cinnamon sticks and cloves. Pour into mugs and enjoy! Use unfiltered apple cider to get all that apple goodness! What's Wrong With a Little Sugar?